The role of mothers / mother figures in Carter's novel "The Magic Toyshop"
Essay from the year 2010 in the subject English Language and Literature Studies - Literature, grade: 1,3, University of Warwick, language: English, abstract: "The social order, our culture, want it this way: the mother must remain forbidden, excluded. The father forbids the bodily encounter with the mother," claims Luce Irigaray at a conference in 1981 (536). The patriarchal order kept women silent and granted them no identity, being dominated by the law of the father who wants to be the sole creator. Women were confined to the function of reproduction and forbidden to create. (533-37) Angela Carter wrote her novel The Magic Toyshop in 1967. This is a time when many riots were about to take place, for instance concerning politics, class, race or gender issues. Women questioned the chains stopping them from experimenting with their reality and pushing them into stereotypical images such as mother or housewife. 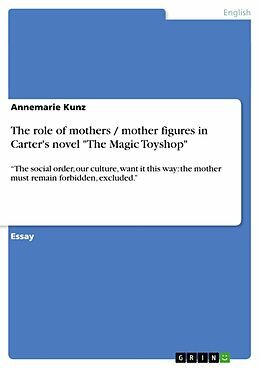 Titre: The role of mothers / mother figures in Carter's novel "The Magic Toyshop"